Most people who are old enough to retire don’t even have enough saved to pay for 3 years of groceries, let alone cover the most expensive third of their life! But you’re reading Modest Money, which means you’ve already started investing in your most important asset: yourself. This gives you an incredible advantage and I want to help. 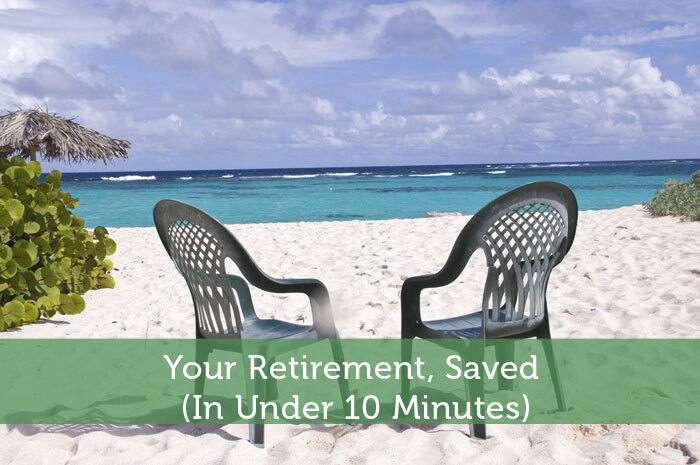 I’m going to share with you a fool-proof method for determining how much you need to save (and how much you need to start saving) in order to live your golden years the way they were meant to be lived. It’s accurate, it’s easy and it takes less than 10 minutes! Using an online calculator is by far one of the fastest and most accurate ways to estimate how much you need to save before retirement. You want one that lets you estimate and defend your own assumptions, such as the one on MSN. Stocks and index funds can give returns around 9%, but they only make money seven out of every ten years. This makes them great for pre-retirement, but bad for post-retirement. 3-Year treasury bills have returned only 3.5%, but they’ve made money every year over the past 85 years! This makes them poor for pre-retirement, by great for post-retirement. Note: Skipping this step alone can cause your retirement to go from luxurious to strapped-for-cash. The government has created tax-sheltered programs to help you along on savings journey. First, utilize your employer’s ‘match’ to the fullest. This usually comes in the form of a 50-100% cash match within a 401(k) or 403(b). If you still have more you need to invest, consider either a traditional IRA or Roth IRA. If you’re planning on being super rich in retirement (yay! ), then you’ll want to put your excess savings into a Roth IRA. Roth IRA’s charge you taxes now (when you’re making less) rather than later (when you’re uber-wealthy). If, on the other hand, you think you’re going to cut back in retirement, then you’ll want to invest a traditional IRA. Traditional IRA’s do the opposite of Roth IRAs (ie. they tax you now when you have less). Have you ever heard the phrase, “Shoot for the moon, so even if you miss you’ll land among the stars?” That’s the kind of retirement we all want. Let your retirement goal act as a minimum and always look for ways to throw a few more pennies into those tax favored plans. Bonus from work? Maybe put a bit towards the retirement fund. Kids just moved out? Perhaps this is a good time to down-size. Even though it may not seem like much, little changes over long periods of time make a big difference. A personalized retirement plan requires a competent coach and advisor to alert you of any risks in your investments. One of the biggest mistakes is getting started before you’re ready. If you have outstanding debt or no emergency fund, then you need to tackle these hurdles first. After all, nothing destroys a great investment faster than withdrawing it early to fix the car’s broken transmission. If you’ve tried budgeting and it either hasn’t worked or it took too much time, chances are you were doing the wrong kind of budget. Stay focused, stay disciplined and you will hit your goal every time! Kevin Shryock is a financial coach and motivational speaker. His mission is to empower and challenge others with inspirational instruction, so that they can take control of their lives and money. So I am about to retire in the military and since I won’t be officially retiring again until another 25 years, I was thinking about buying bonds for I know that it takes about that long for them to major and they would start maturing upon my second retirement. Of course this is just one of a few passive ways I’d like to invest, do you think this idea is nuts? I love the idea of underestimating returns & overestimating life expectancy. All too often people set the bar too low and just barely eek out a penniless retirement. I haven’t poked around a retirement calculator for a while. Time for a peek! My grandpa retired at the age of 62 years. I think he’s one of those Americans who retire with such amount for retirement. This makes me realize how important it is to invest in retirement savings as early as possible. That’s why I started mine at the age of 27 years.